There’s a rite of passage that every serious DIYer has to pass through. One of the stages of that rite of passage is investing in tools that you will need in order to finish your projects. Sure, you can get by renting some tools. But with other tools, you just have to get your own. One such tool is a miter saw. Unfortunately though, buying a miter tool is not as simple as buying a hammer as you will find that miter saws come in a number of variations that are each suited to particular tasks. But fortunately, you, my friend, have happened yourself in the right place at the right time. I have exactly what you need -5 miter saw reviews, all in the same place. This will definitely make your rite of passage easier as you will find all the best miter saws right here. But before we get to the miter saws, perhaps a bit of schooling on what a miter saw is will help you understand what makes a good one. What Exactly is a Miter Saw? A miter saw is a power tool used to easily make quick, accurate crosscuts in work-pieces. I say easy because they allow you to make the crosscuts at various angles of your choice.Most miter saws are relatively small and portable and have blade sizes ranging from 8 to 12 inches. From quickly crosscutting lumber, cutting crown moldings, and decorative trim works, a miter saw is the best tool for the job. Because of this, a miter saw is an indispensable tool for everyone who works with wood. Good question. At this rate, you will soon pass your rite of passage. 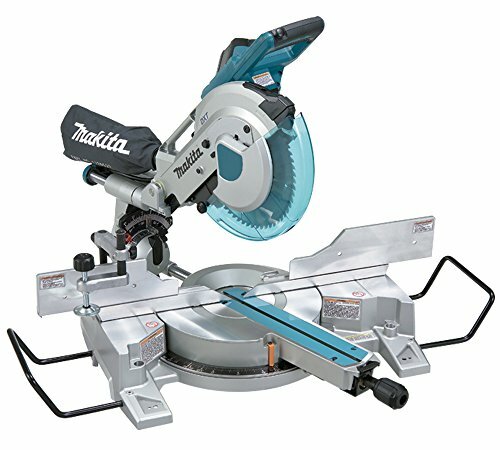 A miter saw makes cuts by pulling a spinning circular saw blade down onto your work-piece in a short, controlled motion. The work-piece is held against a fence which helpskeep the work-piece steady and provides a precise cutting angle between the plane of the saw blade and the plane of the longest work-piece edge. The standard positionon a miter saw is always fixed at 90°. A powerful feature of miter saws is that the miter index easily allows the angle of the blade to be changed. And in the best miter saws, precise one-degree incremental changes to the miter index can be made, while commonly used angles (such as 15°, 22.5°, 30°, and 45°) have calibrated "stops" that allow you to quickly set your miter saw to any of the common angles. Basic miter saws can be used for basic projects (as the name suggests) like cutting trim, making cross cuts, and miter cuts. Their cutting capacity is limited as there is no bevel option. This basically means you won’t be able to make as wide a variety of cuts as with other saws but you will find that a basic miter saw will compensate for that by affording you greater levels of accuracy. Basic miter saws are also relatively cheaper due to their being less complex. If your projects involve a lot of basic cuts, then a basic miter saw should do just fine. A compound miter saw is a cut above a basic miter saw in that it also enables you to make bevel cuts as well. A bevel cut is simply a tilted or slanted cut. Compound miter saws can be adjusted so as to make both miter and bevel cuts. Compound miter saws come in 2 configurations – single and dual-bevel compound miter saws. Single bevel miter saws cut in only one direction, forcing you to move your work-piece if you want to cut in the opposite direction. Dual bevel miter saws, on the other hand, are capable of making both left and right bevel cuts without you having to move your work-piece. 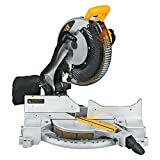 These are the most versatile type of miter saw you can get.Sliding compound miter saws have all the capabilities of a compound miter saw plus the addition of a sliding arm. This allows the saw to cut wider as well as thicker pieces of wood. It is this increased cutting capacity that makes sliding compound miter saws so versatile. And it is also what makes them more expensive. Sliding compound miter saws are best suited for those who work with larger quantities of wood as the cost of buying one won’t be economical if you only work with a limited amount of wood on a limited amount of projects. Now that you know the 3 basic types of miter saws, it’s time to go shopping. Let’s cut to the chase and get to serious business, shall we? Here are the top 5 miters for you to check out in 2018. Dewalt has been the go-to brand for woodworking tools for a long time. And their latest offering, the DeWaltDWS780 dual bevel compound miter saw lives up to the already high bar the company has set. This miter saw is one beast of a saw you’ll be glad to have on your side as you work on your projects. The DeWalt DWS780 is a big upgrade on the DWS718 (yes, great as the DWS718 is, the DWS780 is better). One of the major improvements on the DWS780 is that the power cord and the dust tube now move along with the slides, making the saw more ergonomic. But the biggest upgrade on the DeWalt DWS780 is the new XPS LED system. The XPS system lights the blades from both sides so as to cast a shadow of the blade on the exact line the blade will cut. This eliminates all the guesswork out of your cutting and enhances your precision greatly. This system beats laser systems by far, especially since laser saws will need to be calibrated often. As with the previous model, the DeWalt DWS780 has very accurate pre-aligned stops, again, making life easier for you. The only faults on this magnificent tool are that it is more on the heavier side (nothing a sliding miter saw stand can’t solve though), and the dust collection system that could have definitely been better. Apart from that, if your miter saw budget is in the $$ range, then this is definitely the miter saw to get. If the DeWalt DWS780’s price tag is a bit too hefty for you, perhaps theDewalt DW715 will better suit your pockets (and needs). The DW715 is a single bevel compound miter saw that is equipped with a 12-inch carbide blade and is driven by a powerful 15 amp motor which has a no-load speed of 4000 rpm. 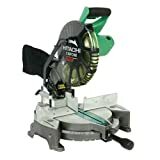 This lightweight miter saw is capable of cutting through any kind of framings and moldings and is able to make any kind of cross and bevel cuts. The DeWalt DW715 comes with a miter detent plate that is made of stainless steel. This is where the DW715 shines as the detent plate comes with 11 positive stops, making it very versatile and easy to set your miter cuts. The miter plate can rotate from 0 to 50 degrees in both directions. To make it easy for you to adjust the miter plate, the DW715 is fitted with a cam lock miter handle and a miter detent override which makes it easy for you to set up miter cuts at angles that are different from the detent angles. As for the fences, they can slide freely and can easily support large crown moldings of up to 5-1/4” and base moldings of up to 6-1/2” vertically against the saw fence. Because the DeWalt DW715 is lightweight (it only weighs 42lbs) and comes with built-in handles, it is very portable and handy for home use. And because it comes with a lightweight price tag of $$ I would strongly recommend this miter saw for beginners. For our next miter saw, we head across the ocean to Japan, the home of the Makita brand. And our miter saw of choice is the Makita LS1016L, a 10-inch dual bevel slidingcompound miter saw. When it comes to precision cutting, few miter saws can compete with the Makita LS1016L. This is especially true since it has a larger capacity when it comes to cutting crown moldings. When it comes to crown molding, you can go up to 6 5/8 inches with the Makita, and up to 4 ¾ inches with baseboards.Dealing with crown molding and baseboards is no problem as the Makita LS1016L features removable rear blade guards. As for miter range, the Makita has a range of 0 – 52 degrees on the left and 0 – 60 degrees to the right. With crisp detents, tight miter lock, and a laser to guide your cuts, precision cutting on a miter saw has never been easier. One other thing you’ll definitely appreciate about the Makita LS1016L is the quietness during operation. This is a result of Makita using a sealed gearbox to drive the blade instead of a chain. The sealed gearbox also has the added advantages of reduced maintenance, increased range of cuts, and a smoother operation. 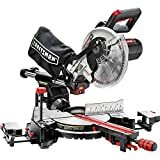 The Craftsman 10” single bevel sliding compound miter sawis one of the best all-around miter saw for the DIYer. This is one miter saw that will give you enough performance and reliability to do most of your projects around the house and in your workshop. This may be a simple miter saw when compared to others on the list, but don’t let that put you off. One of the marks of a good miter saw is the ability to easily handle a variety of blades, helping you work with any material. That’s exactly what the Craftsman delivers as it gives you the ability to easily swap 10” blades in the middle of a task. This Craftsman miter saw comes with a 15 amp motor that delivers sufficient torque to cut tough woods and any other material you may be working with. The standard blade features 60 carbide steel teeth, making the blade more durable. The Craftsman comes with a 0-50 degree miter adjustment that includes common positive stops to enable you to make accurate cuts and tight bevels on the fly. The saw also offers miter detents at 0, 15, 22-1/2, 31.6 and 45 degrees to the left and the right. For greater accuracy, you will appreciate the Laser Trac, Craftsman’s laser system that provides an accurate pre-cut alignment of your work-piece. This is another great beginner’s miter saw, and will only set you back $$. One of the beauties of the Hitachi C10FCH2 10-inch single bevel miter saw is its ease of use. Like the DeWalt DW715, this is an excellent miter saw for both novice and veteran. However, the Hitachi C10FCH2 has a slight advantage of the DW715 in that it has a laser guiding system, which its DeWalt counterpart lacks. 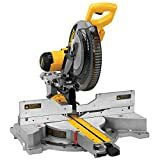 If you are on the hunt for a budget miter saw, this is one that will definitely fit your bill as it is both feature-rich and very affordable. The Hitachi C10FCH2 can make miter cuts in ranges between 0 and 52 degrees, is very ergonomic, and is powered by a powerful 15 Amp motor. All that at a price of $$ makes it a very sweet deal. With such a sumptuous menu of miter saws before you, I know picking one will definitely prove to be tough, so I’ll help you pick two. If your budget allows, the DeWaltDWS780 is definitely the best miter. However, if you are looking for a budget miter, I’d suggest the Hitachi C10FCH2. There you go, it’s time to complete your rite of passage – go get yourself a miter saw.